Capabilities for predicting wind and wave loads on floating offshore wind turbines have reached considerable interest in recent years and they represent both a great hope for renewable energies due to the wind energy potential available in deep water areas, and a significant challenge for engineers and scientists. The design of an offshore production system requires the knowledge of its dynamic behaviour when subjected to given environmental conditions. 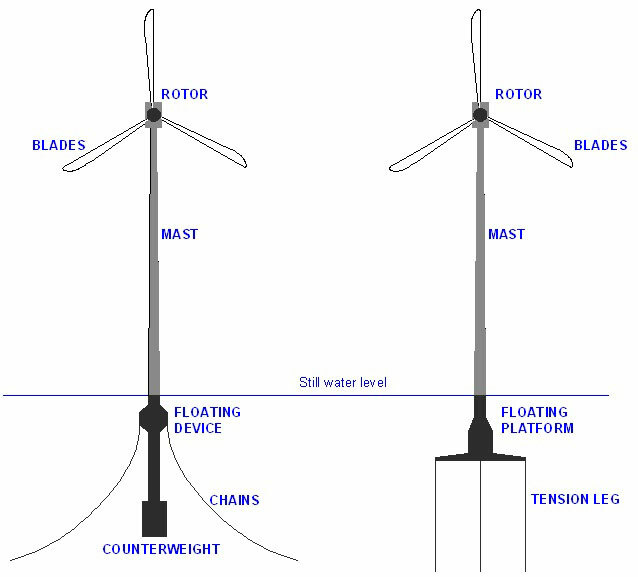 The motion of the turbine is coupled with the dynamics of the floater and the mooring system. Furthermore, the turbine operation requires minimal motions of the mast, which in turn means that we need to develop both floating structures designs with minimal anticipated motions and accurate numerical tools to predict their dynamic response. The calculation and determination of design loads on offshore floating wind turbines is a complex topic involving different wave and wind models, load-calculation methods and probability analysis. The review of recent works in this field indicates that a coupled, or integrated, dynamic analysis is necessary. The objectives of the proposed experimental program are to support the on-going developments of theoretical and numerical codes by the research team. The experimental program will give insight into the physics of the complex problem, which is beneficial for the development of the theoretical work, and also give experimental data for the validation of the numerical methods. The objectives of the tests program were to simulate the behavior of two types of floating wind turbines, exactly a tension leg platform (TLP) and a spar buoy (SB) type, in the most realistic way. For these aims, the dynamics of the floating structures were studied under three basic meteo-conditions: no rotor rotation, operational conditions (rotor in rotation) and extreme conditions (extreme wave conditions with the rotor stopped). Both support structures were tested using unidirectional regular and irregular waves. Furthermore normally incident waves as well as oblique waves under an angle of 20° were tested. Some difficulties were encountered during the assembly of the floating turbine in the wave basin, in particular for setting the proper tension in the mooring lines and also to anchor the ropers at the bottom of wave basin. The analysis and design of floating offshore wind turbines under wave and wind action remains one of the most difficult challenges in coastal and offshore engineering. This is mostly due to the highly non-linear response of the structure, which is commonly subject to severe wave action combined with the chaotic character of the wind. However, the dynamic analysis of these systems is still an unsolved and complex problem due to the interactions between the wind turbine and the floater/mooring system. The experimental tests allowed to obtain important data about the behavior of two floating wind turbine systems, to identify the combined effects of the anchor chains and the wind turbine on the response of the floating body, to study hydrodynamic aspects of a floating wind turbine under regular and irregular waves and under the combined action of wind and waves and, finally, to create a database for numerical model calibration and verification.